Yay! Pandas! I like pandas. Me too Nellie! PANDAS!! X3 If only I went to Paris now... 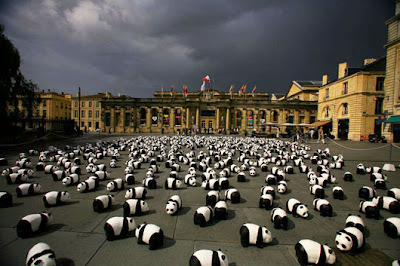 I would have seen those pandas!! Yeah, pandas rock. They're so cute! That is one BUFF dog. The picture of the dog creeps me out (and I love dogs). Ananka!!!!!!! Thank you so much!!! I love this chicken website! It's one of the most informative chicken websites I've seen. When I read things like this, it makes me feel so comfortable knowing about the benefits of chickens. I got my chickens when they were chicks and they used to fly on my shoulders and my arms while I was crouched on the ground. They used to SLEEP there! And there were like ten of them. I think I'll just do a post on my blog about all this chicken stuff, it goes on forever, 'cause it's too nice. Also, my chickens used to chase my cats! When my cats sprinted, the chickens started flying, trying to keep up with them! Jubjub, the cute, fat, fluffy, big baby once eyed my cat innocently sitting in the corner and she ran at him like a bull! It was so cute!!!!!!!! BTW: That muscley dog in the picture looks like it can play in the New Moon movie as Jacob, in the Twilight series. Hehe. Also, check out this website. Irregular Kiki: My mother wants chickens. But it's against the law to have them where we live. Darn you, city limits!! Pandas are amazing! 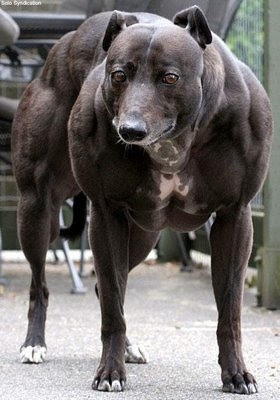 And that mutant lookes like a greyhound on steroids. I LOVE PANDAS! MY FAV ANIMALS ARE PENGUINS PANDAS AND ZEBRAS. =) I just had ice cream. That is all really really really reall cool! The dog is sort of sad though. I used to keep chickens when I lived on a farm. Sometimes they slept in my hair! All of you guy's comments about the "dog" are hilarious. undiscovered universe: That is so cute! My once's couldn't balance on my head, so they could only stand on it and clean themselves, not sit. Sometimes they even dug my hair with their beak and feet. I love it when they do that!